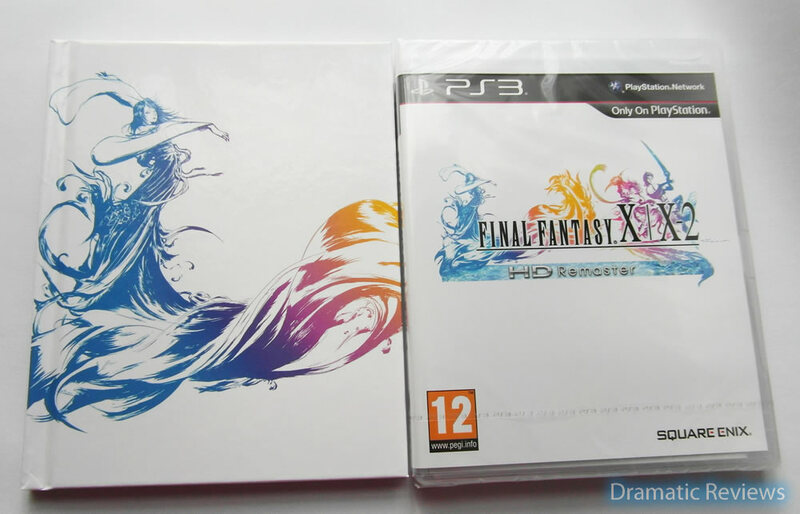 Inside the cardboard case, you get the Limited Edition artbook, and the game in its standard packaging. 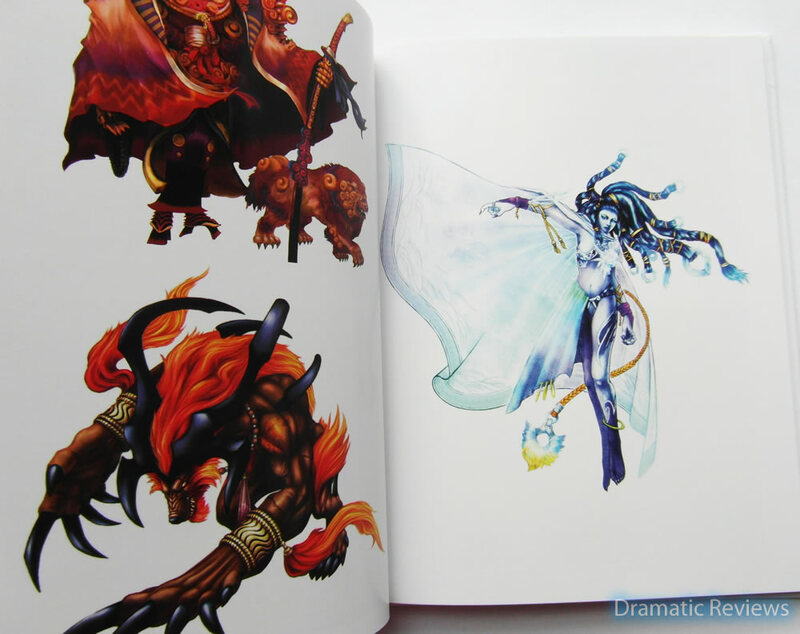 The artbook, which was the main incentive for buying the Limited Edition, is absolutely brilliant. It starts with a forward from Yoshinori Kitase, the producer of the original game. Just the quality of the artbook blew me away. 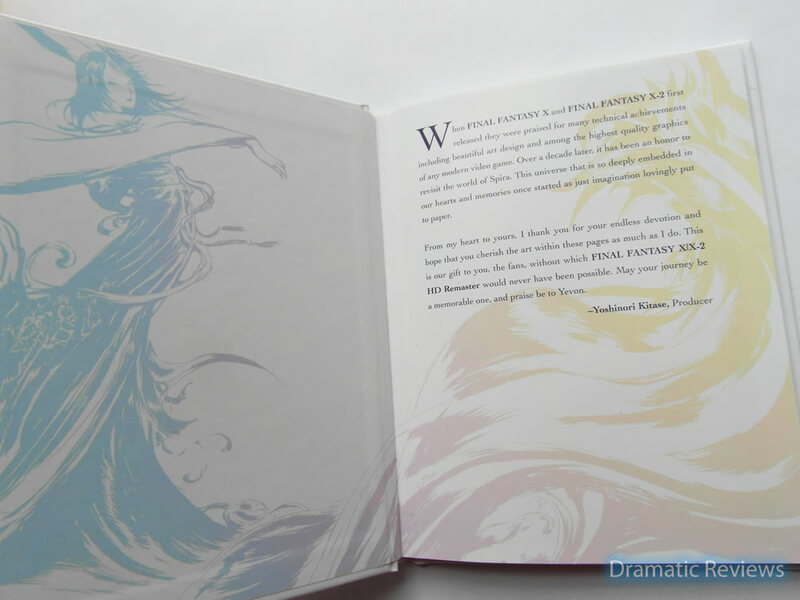 Everything is done in the theme of Final Fantasy X, and you can see things like the original logo washed over the inside of the hardback. 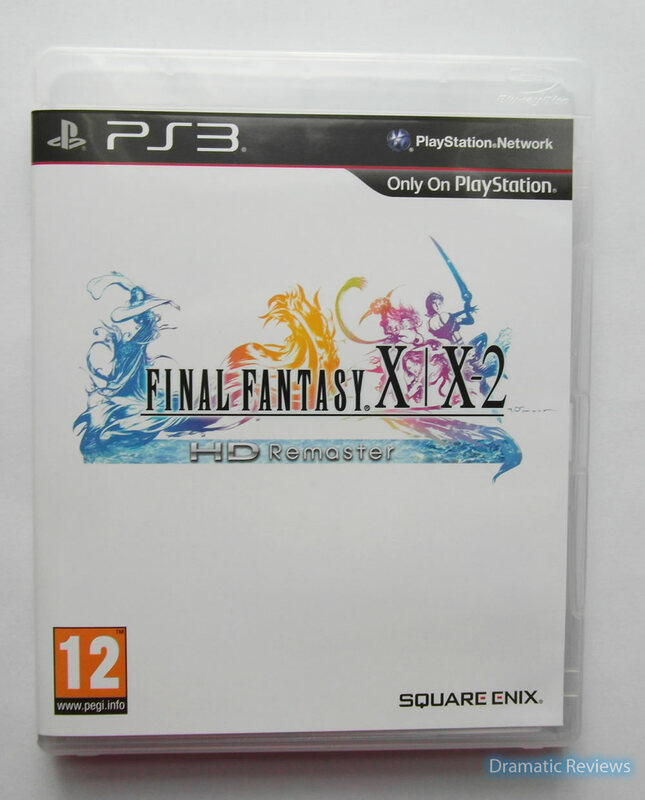 The artwork covers both Final Fantasy X and X-2, but is pretty selective in it’s approach. You will find gems like the Aeons, which are beautifully printed. True the artwork is old, but I haven’t seen in it this quality before. There is also some background concept art, and some alternate versions of places. A pretty interesting look at how the game could have turned out. 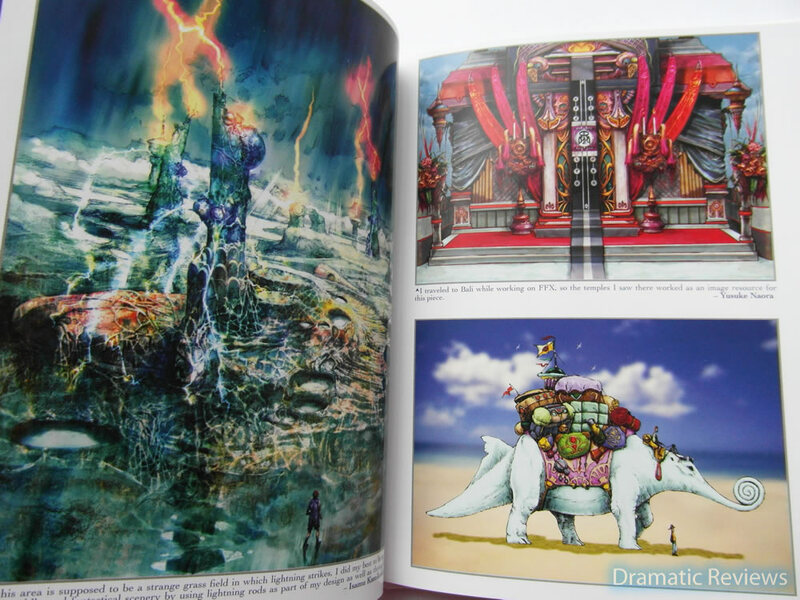 Although the artbook isn’t particularly large, you can see above that it’s the same height as a standard PS3 game case, it allows enough space for full-page illustrations and even commentary. 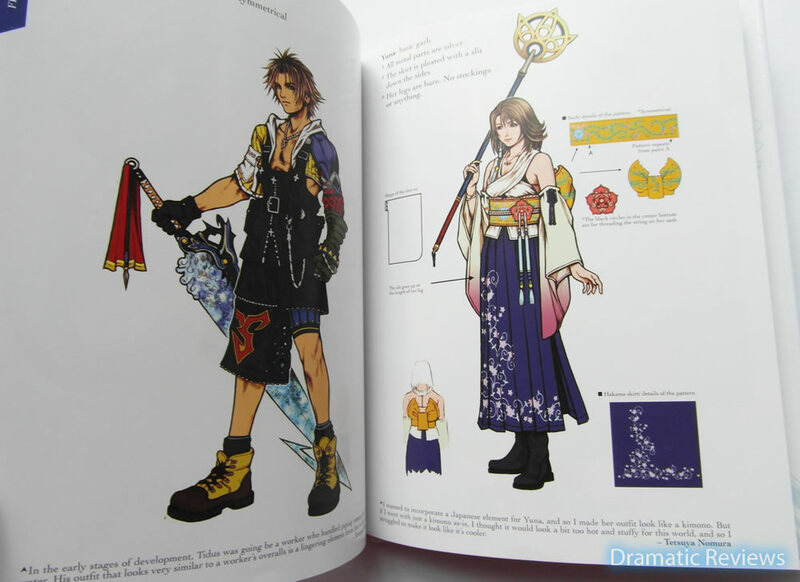 Sadly, there is only a double page of character art, and those pages are reserved for Tidus and Yuna. I have seen these images a million times. I’m sure they have been circulating the internet since the first release. 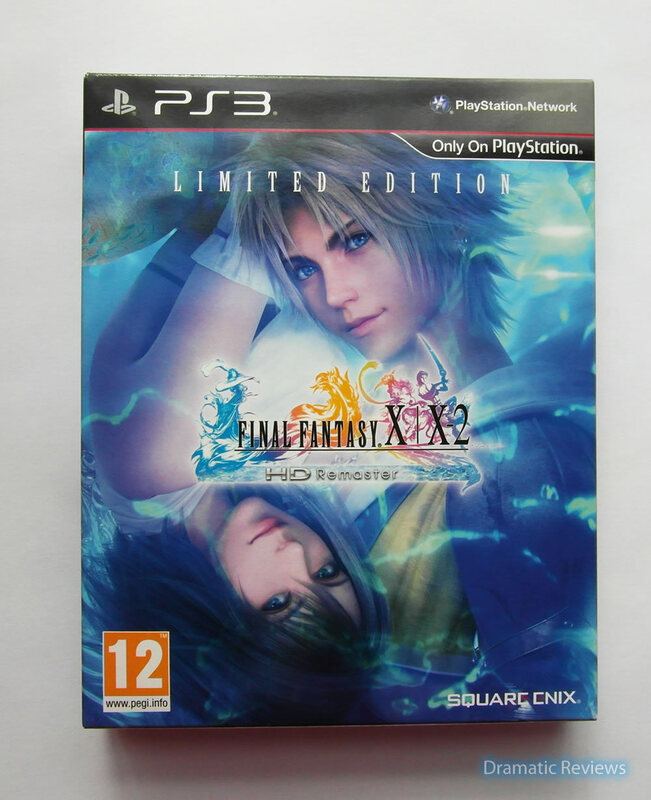 Moving on to Final Fantasy X-2, the artbook doesn’t make as much an effort with with X-2. 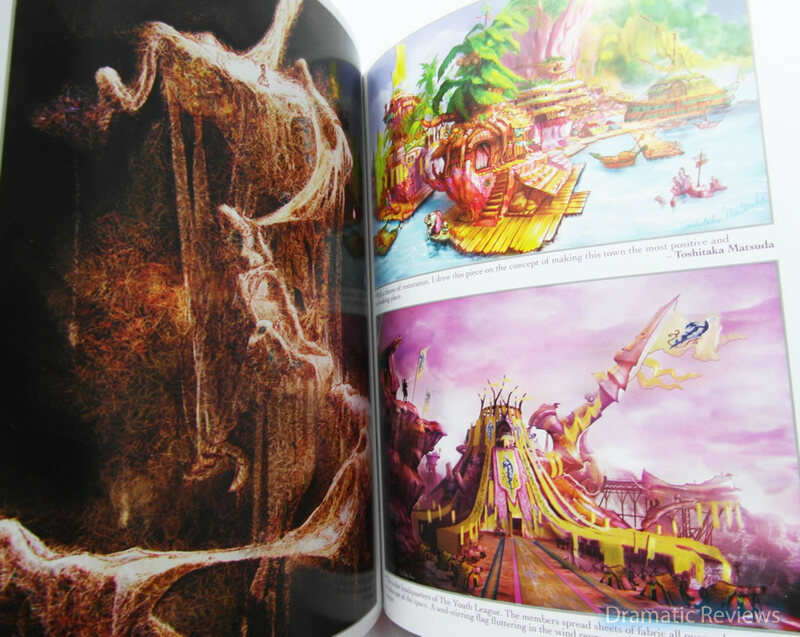 I already have artbooks and guides which have given me much larger/better glossy prints of these images. They are nice to have, but seeing as FFX is much superior to FFX-2, and is actually rarer, more space could have been given to prequel. 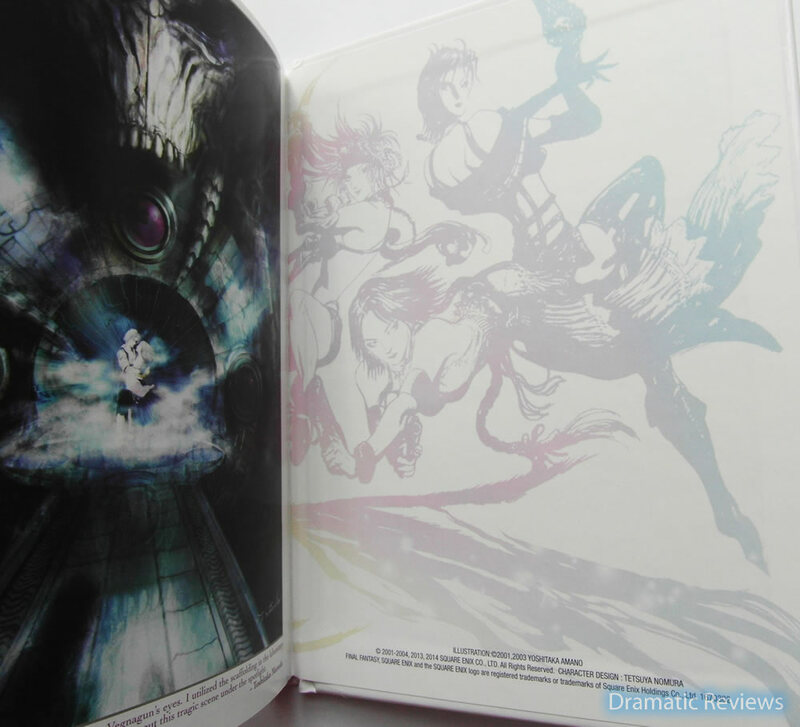 The back of the book has a similar watermark to the front, but featuring the ladies from X-2 instead. 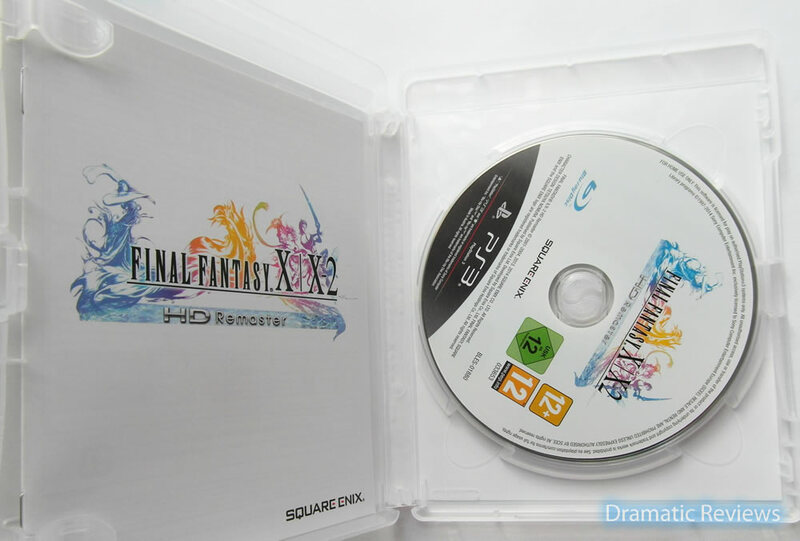 The actual game case follows suit with the previous UK versions of Final Fantasy, and has the logo on a white background. Some people might not find that exciting, but being a traditionalist, I am very pleased. 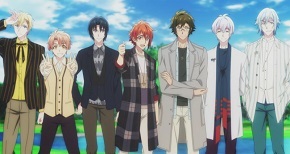 It is uniform with the previous UK versions. 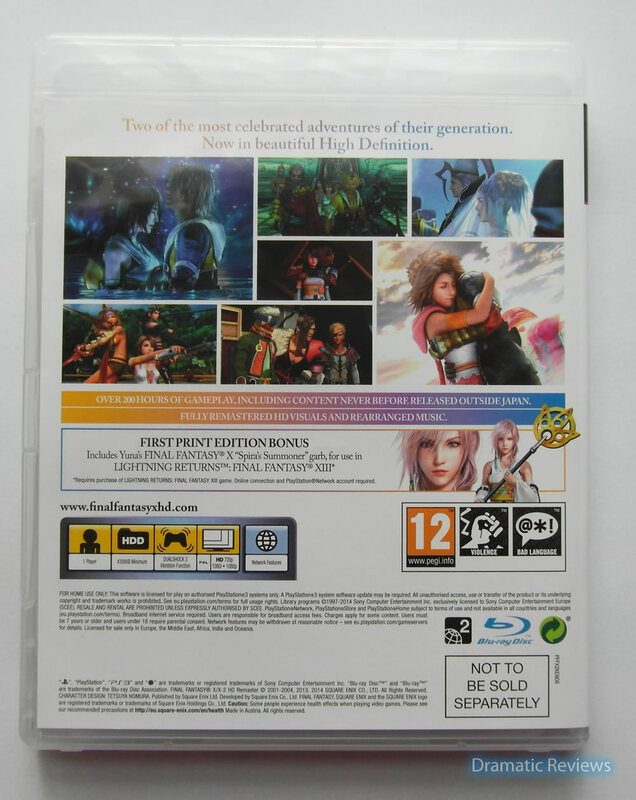 The back of the game case repeats the same information as the back of the outer cardboard case. Lightning seems to get particular attention in this case, due to the very close release of Lightning Returns. I don’t actually own Lightning Returns (yet), so this free Yuna costume is useless to me at the moment. I will redeem it at some point. The inside of the game case is pretty basic. There is only one disc, since both games are together. The “manual” is just some technical information, it is nothing like the full-colour introduction that I expected. To be fair, I wouldn’t normally pay attention to the manuals of games, but I was hoping for something special tucked away. This is the back of the outer case, and as previously mentioned, it repeats information from the back of the game case. The game was eventually being sold for £35 at pre-order, but due to some luck and bargain vigilance on my part, I managed to buy this for £25. I’m pretty pleased with the final product. Not sure I can dedicate much time gaming at the moment, since work keeps me busy, but at least this edition is my hands. 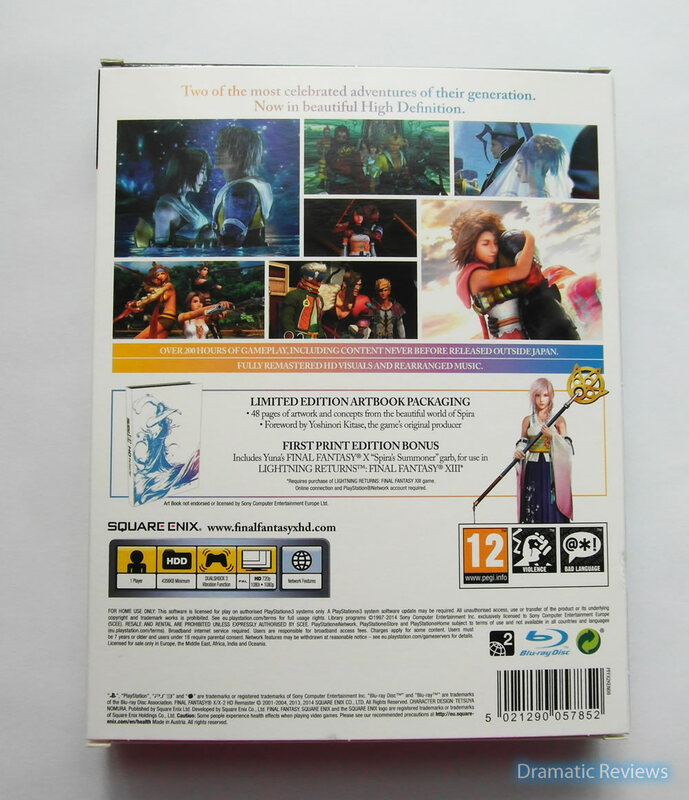 You can purchase the Standard and Limited Edition of Final Fantasy X HD.